This house, now available for sale in Thai Company name, is well furnished, neutral and comfortable. The house is only 1-year old, with a modern open-plan European style kitchen installed inside, and a Thai kitchen outside. 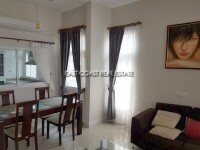 It has 2 bedrooms and 2 bathrooms and is situated on 100 wah of land. The house is being sold fully furnished, with an asking price of 3,500,000thb. The title deeds are held in Thai Company name, so there are no expensive tax and transfer fees. It is air-conditioned throughout, with paid cable television and internet systems already installed. The house has private parking, and a private garden and really is a must-see for those looking for a modern and spacious home.